This has been a week of much darkness for our nation. The lives of 27 innocents - many of them young children - were lost in a single act of unspeakable violence. The individual who perpetrated those very acts was someone who is reported to have been on the autism spectrum, and as a result we've seen the media and the public latch on to the misguided and incorrect idea that there is a link between autism and planned violence. I could rail on about the way in which is it wrong to compare my child to another human being - particularly one who is responsible for such a heinous act - simply on the basis of a shared diagnosis, but that doesn't accomplish my ultimate goal. I've already addressed that in a post yesterday titled Simply Evil, but I want - I need - to move on from that place. Pointing out the misconceptions only goes so far. What I want is for the world to see my boy for who he is, not who they imagine him to be. In order to break down the ignorance, bigotry, and misconceptions about autism that are flourishing in light of such tragedy, we need to show the world just how wonderful our children truly are. We need children like my son, like your daughter, like your children, to be the faces that people see and think about when they hear the word "autism". We need to steer the world away from their preconceived notions of autism and show them what autism really is. It's time to bring the world into the light. I would like to personally introduce you to my boy. He's almost 4 years old (a fact that blows his mommy's mind every day) and he has multiple disabilities, with the primary one being autism. My boy loves the PBS show Super Why! 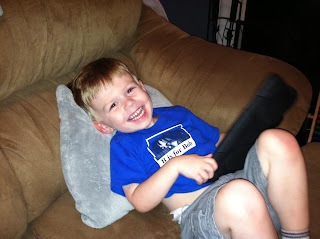 His favorite toys are magnetic letters, his iPad (he loves his Thomas and Friends and Super Why! games), and bubbles. He could pop bubbles all day long and gleefully squeals "More!" to ask for yet another shower of bubbles from either his father or myself. While he doesn't eat many foods, he does love McDonald's French Fries...just like every other 3-year old in America. Still in the midst of his "babyhood" - which autism has prolonged in a way that this mama has learned to appreciate - he wakes his mama up each morning with an adorable string of babble over the baby monitor. When I enter his room, he is laying in his crib clutching a red sleep sack and looking up at the ceiling with a smile. Seeing his smiling face greet me early each day is truly the best part of waking up. He radiates joy when he enters a room. I tell people often that my boy does happy with his whole body. When he gets happy, he raises up on his toes. He bounces lightly in place. His hands flutter and flap, sometimes so vigorously that I think he might take flight. A smile spreads across his face from ear-to-ear as he engages in this bursting forth of energy and happiness and light. He works harder than most children his age have worked in a lifetime. He spends hours each week in speech, occupational, and physical therapies and special education to accomplish what other children do so easily. Would you know, he does it with a smile most days! He puts forth so much effort each and every day. As a result, each little victory - each jump, each word, each giggle - is a precious treasure in my eyes. I couldn't be prouder of every single thing that he does. And the words! I hear people with typical children tell me that they just wish their children would be quiet, but I say never. Let my boy speak and speak and speak. Each word has been hard fought for and each word is one that I thought I might never hear. Each word spoken in his tiny high-pitched voice is simply music to my ears. I never tire of those little words, no matter the meaning. My angel has a legion of therapists, teachers, aides, and other providers - in addition to a very proud Mommy and Daddy - who think he is one of the greatest people we have ever met. He is sweet, adorable, and full of light and beauty and all that is good in this world. To me, he is love personified. There is not a violent bone in his body. When another child takes a toy from him or hits him, he just stands there silently, looking at the ground. He doesn't retaliate. He lets the temporary assault roll off his back. He simply turns off for a moment or two and then moves on. No monster there, just someone who wouldn't harm a fly. Just someone who is the heart and soul of his mama. Just a little boy full of joy and happiness and all things good. Just a little guy who is all boy. Just a beautiful little boy with autism. He is exactly what we should think of when we think of autism. We should think of hard working children who need support to accomplish great things. We need to think about those smiles, that outpouring of joy, and the brilliance that is each of our children. We need to think of all of the good and decent and wonderful things that each and every one of these children bring to our lives. So, I ask you to join me. Share your stories below - either by attaching a link to a blog post of your own or by providing a short description - and introduce your children to the world. Help the world see and understand and know our children to be the wonderful little people that they really are. Take a look at the stories shared here to get a true understanding of the beauty and diversity and light that exists on the autism spectrum. Let's see if we can make this happen. Let's see if we can band together to paint a picture of how wonderful our autistic children are. Let's make it happen and let's change the world. Jeanie is a former engineer turned stay-at-home wife and mom to an amazing 3.5-year old little boy on the autism spectrum. After her only child was diagnosed at 24 months with autism and an alphabet soup of special needs, she began to write about life parenting a very young child with special needs with honesty, optimism, and as always, a touch of humor. When not posting here, you can find Jeanie at her regular blog, Reinventing Mommy. She has also been featured on The SPD Blogger Network and The Oxygen Mask Project, to name a few. To follow more of her ramblings, like her on Facebook or follow her on Twitter! Love it! This is what everyone needs to see...our wonderful kiddos. Come on, everyone - let's get some more posts! Here's one I wrote when Billy's first IEP was finalized. Great post and great idea. I don't have a blog but here is a brief description of our daughter. She came to us through adoption from overseas after 4 years of moving in and out of various orphanages and foster homes. We knew she had special needs when we brought her home but didn't know the full extent. She is now identified on the autism spectrum and also has intellectual disabilities. She is capable of scratching herself and other kids and kicking out at them when frustrated, but we are working with her to learn how to handle frustration better. She loves Dora and "The Napping House" and getting her nails done. She perseverates on kleenexes and has a veritable cloud of tissues she collects in her bed. She loves high heels and sparkley things. She loves her 3 brothers and also drives them nuts at times, like all sisters do. She can be a challenge at times but so can her neuro-typical brothers. We are so glad she is our daughter and so privileged to be her forever family. Thank you everyone for sharing your children! Please keep the stories coming! Let's show everyone how wonderful our children really are!